• at least one question in Section two. …who is in school years 3 to 9 inclusive? …who attends a state-maintained school in England full time**? 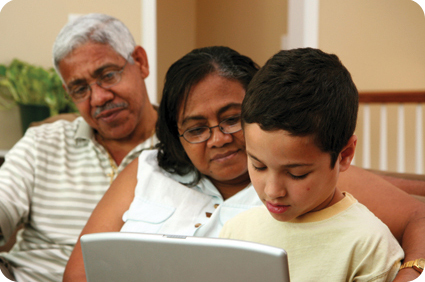 …who has not already had a computer from a Home Access Grant or similar programme, such as Computers for Pupils? ... who has a Statement of Special Educational Needs, or receives a Disability Living Allowance, or whose school/local authority representative can certify they have Assistive Technology needs? Do you receive at least one of the following? If you think you qualify for a Home Access package with Assistive Technology please call the Home Access Helpline on 0333 200 1004* to get an application form. You must be the adult responsible for the child you are applying for. You must share the same address as the child or be the foster carer of a Looked After Child (who has Special Educational Needs) as defined by the Children Act 1989. ** or whose place is paid for by their local authority or the Department for Education (DfE). If you have elected to school your child at home they are ineligible for a Home Access package. However, if your child is home schooled as a result of ill health or an ongoing medical condition they may be eligible. State-maintained schools include: primary schools, secondary schools, middle schools, special schools, academies, city technology colleges, pupil referral units. State-maintained schools do not include: independent (private) schools and places at non-maintained special schools not funded by a local authority.